Great STEM teaching is not an accident. Teachers have to know their students. They have to create lessons that draw in their students while challenging their abilities. And these teachers have to continue their own learning in this rapidly-evolving subject area. 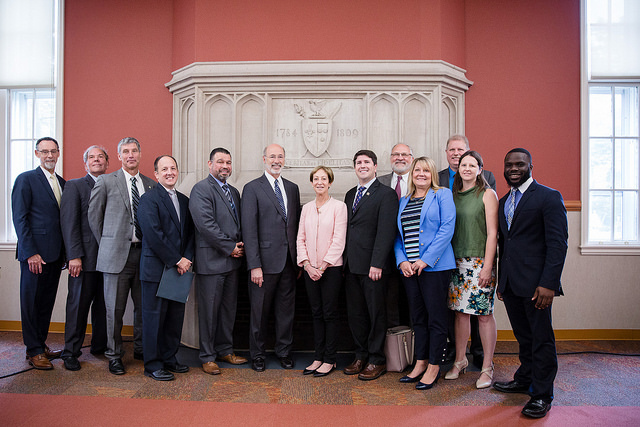 On September 7, Pennsylvania Governor Tom Wolf and Arthur Levine, president of the Woodrow Wilson National Fellowship Foundation, announced that Penn GSE is a partner in the Woodrow Wilson Pennsylvania Teaching Fellowship, a three-year program to better prepare and support STEM teachers for careers working in high-needs urban and rural schools. Starting in 2019, Penn GSE will welcome Fellows who will receive a stipend, training, and mentoring through the program, which is also being supported by the William Penn Foundation and the Weiss Family Foundation, among others. To date, more than 1,200 teachers have been prepared through the Woodrow Wilson Teaching Fellowship program. In previous states, 80 percent of Fellows continue teaching in high-needs schools after their three-year commitment has ended. Kate Kinney Grossman, Director of the Urban Teaching Apprenticeship Program at Penn GSE, said the Fellowships offer an opportunity to recruit people who otherwise might not have considered a career in teaching. That, she said, presents a great opportunity for Pennsylvania’s students. The vast majority of Fellows enter their master’s programs with an undergraduate degree, work experience, or both, in a STEM field. “I get to work with experienced STEM teachers, as well as aspiring STEM teachers, and observe first-hand how they move young people to be excited about science, math, and technology,” Kinney Grossman said. Duquesne University and West Chester University will also host Weiss Woodrow Wilson Teaching Fellows in Pennsylvania. Graduates of the program will commit to working at least three years in high-needs schools in the School District of Philadelphia or in Pittsburgh and its surrounding communities of Penn Hills, McKeesport, and Woodland Hills. 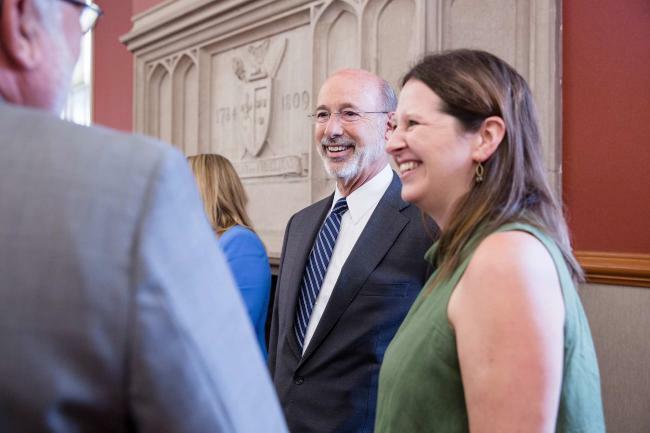 In announcing the program, Wolf noted that as Pennsylvania’s economy continues to evolve, STEM skills will become increasingly important in the workplace. By committing to teach in high-needs schools, Wolf said these Fellows are helping to make sure students in rural and urban areas have the same opportunities as their peers in more affluent communities. Levine, of the Woodrow Wilson National Fellowship Foundation, described how other states and universities have used the Fellowships as a jumping off point to reimagine how STEM teachers are trained. With strong foundations in place to build on, Levine said Penn GSE, Duquesne, and West Chester could create a new template for STEM education.